Bring a pot of salted water to a boil. Add the soba and cook until al dente. Rinse well with fresh water, then drain and set aside. In a large skillet, heat up the coconut oil, sauté the garlic, ginger and hot pepper just until golden. Add the sliced bok choy and sauté just until bright green. Deglaze with mirin, sauté for an additional minute or so and then add in the tamari and hot sesame oil. Toss in the cooked noodles and stir through to combine everything well. Serve hot or cold. 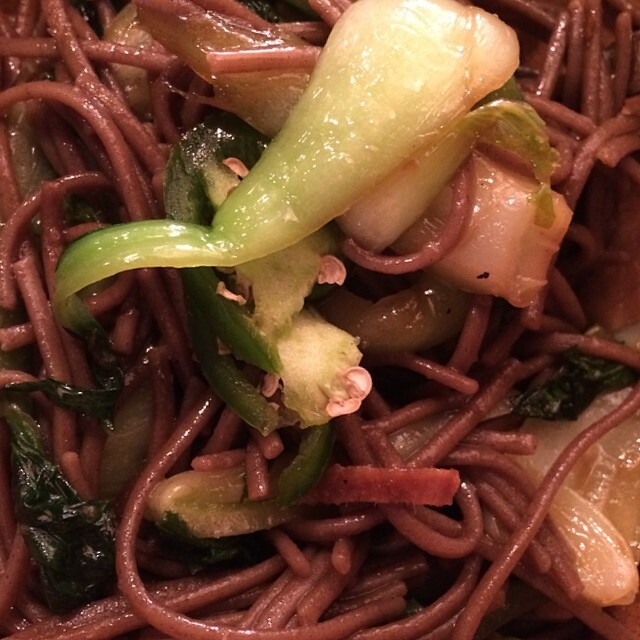 This entry was posted in buckwheat soba, coconut, Gluten Free, pasta, Vegan, vegetables and tagged animal free, bok choy, buckwheat soba, cooking at home, crossfit fuel, eat clean, eat real food, fricken delicious, fricken yum, ginger, gluten free, noodles, quick protein, sesame, sesame oil, soba, THE VEGAN LOVE PROJECT, train dirty, vegan crossfitter, vegan crossfitting, vegan protein, yoga fuel. Bookmark the permalink.